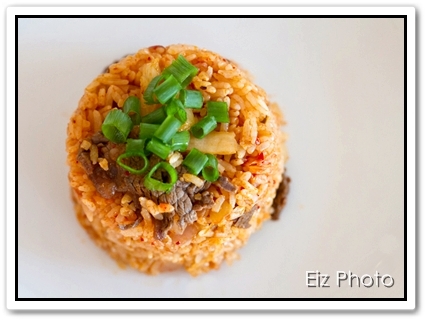 The 1st time I tried PY’s kimchi fried rice, it was so yummy and I wanted to try cooking it myself. I think that was more than a year ago. Finally, I decided to make it for cell group today and oh, how I love kimchi fried rice. 1. Heat up wok or large pan with cooking oil and sesame oil over medium heat. 2. Saute the onions and garlic till soft and lightly brown. 3. Add the kimchi and saute for another 3 mins. 4. Add the beef and cook for another 2 mins. 5. Add the rice, soya sauce, sugar and hot pepper paste. Mix thoroughly. 6. Serve hot with a sunny side up.